Stakeholder categories11 Jan 2018 Brussels - The 'targeted stakeholder consultation' on the Common European initiative on High Performance Computing (HPC) was held from 3 August to 5 September 2017. The responses of participants and stakeholders who gave their consent to publication as well as a synopsis report analysing the results of this public consultation are now available. Through the targeted consultation the Commission engaged with the public to gather views in particular on the current state of HPC in Europe and on the need for a new EU initiative on HPC. The consultation confirmed the result of a preliminary study, done by the Commission, incorporating the analysis on the problems with the current state of HPC in Europe and a large majority of respondents requested an EU intervention. There is a need for a more ambitious pan-European political initiative on HPC, supported by a new financial instrument to tackle the identified problems such as the limited interaction between academia and industry, the large fragmentation of HPC programmes in Europe, and the European dependence on non-EU suppliers. The Commission has taken into account the results of the public consultation in its work on the modernisation of HPC in Europe, and will create a new Joint Undertaking financial instrument. The online consultation gathered 92 replies from organisations in 17 Member States and 4 non-EU countries. The largest number of responses came from Spain (14.1%), France (13%), Germany (12%), UK (9.8%) and Italy (6.5%) totalling 55% of responses. 34% of responses came from the other Member States (Portugal, Sweden, Czech Republic, Netherlands, Ireland, Austria, Belgium, Finland, Slovenia, Cyprus, Luxembourg, Greece) and ~11% from the participating non-EU countries (Israel, Norway, Switzerland, USA). 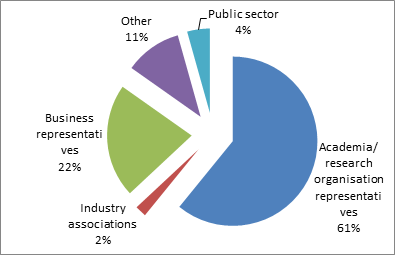 Europe's supercomputing capabilities depend on non-EU suppliers for critical technologies and systems (47.8%). In addition to the lack of sufficient resources and insufficient access to HPC resources for science, a recurring perception was that too little emphasis is given on software developments given Europe's recognised world leading role in HPC applications. Only ~2% of respondents found that no EU action should be taken to improve HPC in Europe, 15% were satisfied with current EU actions; 83% of respondents confirmed the need for EU action beyond the current level. 1. EU coordination and cooperation of HPC initiatives is insufficient, resulting in strong fragmentation between current EU initiatives, individual Member States' and stakeholders' efforts. 2. The EU is bound to trail its global competitors (USA, China) in this strategic field if it continues its fragmented efforts. Replies requested to be anonymised .